Countertops are heavy-duty kitchen work surfaces. Because they are used constantly for food preparation and even as chopping boards, they are susceptible to scratches, spills, and hard knocks. The ideal countertop should be easy to clean as well as stain-resistant and scratchproof. However, countertops are a very visible part of the kitchen, so their appearance must also be considered, to complement the kitchen cabinets and appliances. No countertop material is perfect, so you will have to consider the pros and cons of each before settling on one. 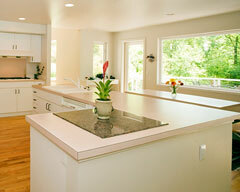 KitchenCountertops.us features a good summary of the pros and cons of each material. 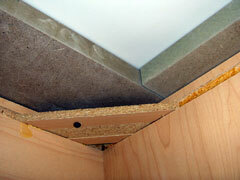 Most materials, especially porous ones, must be sealed prior to use. Some sealants must be reapplied at regular intervals while others are formulated to last a lifetime. Wood needs to be re-oiled quite regularly, whereas granite only needs to be resealed about once a year. Certain countertop materials, such as concrete, granite, and glass, are very heavy and need strong structural support beneath them. Before using these materials, consult with the supplier or an architect. If there is any question whether the underlying support is adequate, consider using a lighter weight material. 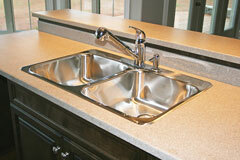 A countertop is usually interrupted by a kitchen sink with its associated faucet and pipes. Wood, laminate, and solid surface composite countertops can be worked to accommodate cut-outs fairly readily but making cut-outs in brittle and inflexible materials such as stone or glass is more difficult and often expensive. While choosing your countertop material, consider whether you want a drop-in, integrated, or undermount sink. Drop-in sinks will work with any countertop material; undermount sinks can be used with any type of countertop except wood; and integrated sinks will work only with waterproof materials such as Corian and engineered quartz or stainless steel. Most built-in floor cabinets are 34 1/2 inches high, so the countertop will usually be about 36 inches above the floor. Desk drawer cabinets are 29 inches high and may be useful as bases for children's work areas and seating spaces. Lower countertop heights can also make certain kitchen tasks easier. 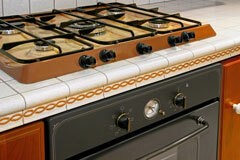 Invented in 1913, Formica laminates are perhaps the most widely-used countertop material. They have been used in homes and cafes around the world and have acquired a certain retro appeal; their low-maintenance surfaces and affordability continue to make them a popular choice. Some kitchen designers note that different countertop materials are best suited for different tasks, and suggest incorporating multiple types of countertop in a single kitchen. For instance, wood is great for slicing and chopping; stainless steel is easy to clean and is not susceptible to heat damage; marble and glass are well-suited to pastry and candy making. From this we see that stainless steel countertops near the cooking area, wood in the food preparation area, and a laminate or composite material near the sink could make good sense. 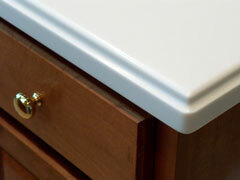 It's easy to think only about the top of your work surface and forget about the edge profile of the countertop. Various edge designs are available for solid material countertops. For improved safety, select edges with smooth, rounded designs and no sharp corners. Laminate and tile designs need separate pieces of material for the edges, so they can be fabricated in a contrasting color or material. The National Kitchen & Bath Association is a non-profit trade association that features kitchen planning guidelines and resources for consumers and industry professionals. And be sure to visit these kitchen cabinet and local kitchen countertop resources if you are planning a new kitchen. If your plans don't call for an extensive project, you can still find information about kitchen appliances and furniture for your kitchen at these websites. Countertop Supplier Directory - countertop suppliers throughout the United States of America, organized by state. Each directory entry includes an organization name, location, phone number, and website link.